Some like 'em sweet. Some like 'em hot. Hot or sweet, have peppers your way in a wide range of colors. As a gardener, chances are you are growing a number of varieties of pepper plants. Peppers are generally categorized into two groups... sweet peppers and hot peppers. Listed below, are the most popular peppers you can grow. Sweet peppers are enjoyed by most of us. Most often, we pick sweet bell peppers when they are green. At this stage the fruit is crisp. It is actually considered ripe when it turns red. At the ripe stage it is softer and sweeter. Some less common varieties produce yellow, orange or brown(chocolate colored fruit). They are great for adding color to salads and relish trays. There are two varieties that are pretty much neck and neck in popularity, and constitute the vast majority of sweet peppers grown in home gardens. They are California Wonder and Lady Bell. 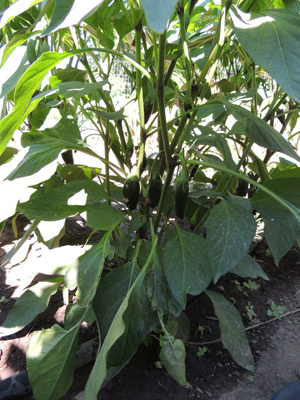 California Wonder - This pepper plant produces one of the best, large sweet bell peppers. This pepper plant produces more fruit than Lady Bell, but they are a little smaller. Space limited? Try growing it in a container. Chinese Giant Sweet Red - The fruit is huge! Measures up to 5-6 inches deep and side. Emerald Giant - This pepper is gigantic in size and flavor.Dark green peppers turn red when ripe. they are crisp and tasty. Lady Bell Sweet Pepper - Produces large, meaty fruit right up to frost. 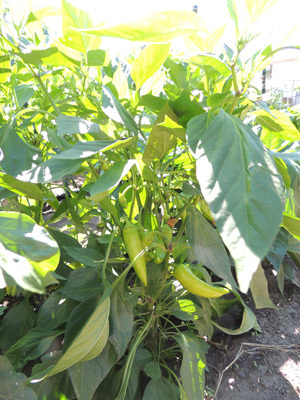 In our experience, this pepper plant produces fruit slightly larger than California Wonder Sweet Peppers. Mini Bell Blend - A relative newcomer, this sweet pepper produces many small yellow, red, and brown sweet peppers.The plants grow about 24 inches tall. Color Mix Bell - A packet of these seeds rewards you with a rainbow of fruit, including green, red, yellow, orange and purple. Fruit is bright, crunchy, spicy, yet sweet. Cubanelle - This large sweet pepper is excellent for frying. Fruit grows to about 6 inches in length, and is yellow-green, turning to red when ripe. The plant produces a continuous profusion of fruit. Purple Bell - This pepper has an eye-catching purple color. It's a high yielder, with disease resistance. Fruit has thick, meaty walls. Use it for slicing, in stir-fries, to or add color to salads. Red Mercury - This vivid, scarlet pepper is noted for its versatility. Use it in relishes, sauces, or baking. Freezes well. Sweet Banana Pepper - Bored of sweet green peppers? Then, it's time to try Sweet banana peppers. This All America Selection winner produces very sweet fruit. Peppers grow six to seven inches. The pale, yellow fruit ripens to a bright red. Try them in salads, grilled in stir-fries, or stuffed. There are varying degrees of "hot" peppers. How hot do you like it?? Anaheim Chili - This pepper has the least "heat". But it has a good flavor. The large, six to eight inch fruit turns from dark green to a brilliant red when ripe. This pepper is popular for drying. Caribbean Red Pepper - A Habanero pepper that is fiery hot. It produces red, wrinkly fruit. This hot pepper rates between 350,000- 450,000 on the Scoville scale. Cascabella - This is a pungent, cone shaped fruit, just a little over an inch long. Cascabella plants are prolific producers of fruit, that is bright yellow or red when ripe. Try this pepper in salads and sauces. Long Cayenne Pepper - This pepper is fiery hot. Fruit grows about five inches long, turning from deep green to a brilliant red. It's best known for heating up chili. Habanero Hot Peppers - This electric-orange pepper is the King of the hot peppers. It is absolutely the hottest pepper you can grow. Slightly wrinkled fruit grows one inch long, turning from light green to a fiery orange when ripe. Hungarian Wax - These "medium hot" pepper is especially zesty and attractive when pickled. It is good raw and cooked. 5 to 8 inch long fruit has a smooth skin. They turn from bright yellow to red when fully ripe. Jalapeno Pepper - One of the best known hot peppers is Jalapenos. Most people think this is a pretty hot pepper. Many growers pick the dark green fruit when it reaches 2-3 inches long. If left on the plant, it turns a fiery red when ripe. Jalapenos are great stuffed, or sliced for use in a wide variety of Tex-Mex dishes. Pepperoncini - These peppers pack a mild heat, and turn sweeter as they ripen. The fruit starts out as green or yellow, ripening into a Mars-like red color. Pepperoncini are delicious in Mediterranean salads, pastas and sandwiches. Poblano / Ancho - As far as hot peppers go, Poblanos are on the mild side. But, they are tasty. They are the main ingredient in chile rellenos. Poblano peppers are wonderful roasted and peeled. Mature fruit measures 6 inches long and 3 inches wide, and are reddish-brown when ripe. They are called Poblano when fresh, and Ancho when dried. Serrano Chili - One of the hottest around, Serrano Chili pepper plants produce an abundance of small fruits, ripening from dark green to crimson. As it's name implies, it is used to make chili sauce and pepper sauces. Thai Hot Pepper - Many people grow this plant as an ornamental. It is attractive in your garden or in a container on your patio or deck. In addition to being a hot looking plant, it's fruit is fiery hot, too. Thai peppers grow about one inch long, and are bright red. When it comes to hot, they take second place. Only Habaneros are hotter. Plants grow about 18 inches tall. Tobasco Chile Pepper - Best known for it's use in tobasco sauce, tobasco pepper is a real "hottie"with good flavor. They are also good in salsa and stir-fry dishes. Plants grow up to four feet tall. As the 1 1/2 inch fruits ripen, they turn from green to orange to red. Hot Tip: Use caution when handling hot peppers, or when planting the seeds. We suggest you wear food safety gloves. Whatever you do, do not touch your eyes after coming in contact with any part of hot peppers - plant, seeds or fruit. Capsaicin .... How hot is your hot pepper? Capsaicin is the "Heat" in your hot peepers.